Naalehu is a census-designated place in Hawaii County, Hawaii. 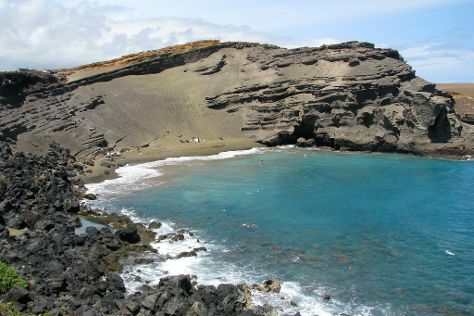 Start off your visit on the 5th (Thu): stroll through Punaluu Black Sand Beach and then kick back and relax at South Point (Ka Lae) and Green Sand Beach. To see reviews, more things to do, and other tourist information, read Naalehu sightseeing planner. Page to Naalehu is an approximately 12.5-hour flight. The time zone difference when traveling from Page to Naalehu is minus 3 hours. In October, plan for daily highs up to 71°F, and evening lows to 50°F. Cap off your sightseeing on the 5th (Thu) early enough to travel to Volcano. You'll get in some beach time at Laupahoehoe Beach Park and Richardson Beach Park. Get in touch with nature at Akaka Falls State Park and Thurston Lava Tube (Nahuku). Explore Volcano's surroundings by going to Hilo (Extreme Exposure Fine Art Gallery, Rainbow Falls, & more). The adventure continues: hike along Kilauea Iki Trail, contemplate the geological forces at Mt. Kilauea, and see the interesting displays at Jagger Museum. To see more things to do, traveler tips, ratings, and other tourist information, go to the Volcano trip generator. You can drive from Naalehu to Volcano in an hour. Prepare for a bit warmer weather when traveling from Naalehu in October: high temperatures in Volcano hover around 83°F and lows are around 69°F. Wrap up your sightseeing on the 8th (Sun) early enough to travel to Kealakekua. Kealakekua is a census-designated place (CDP) in Hawaii County, Hawaii, United States. On the 9th (Mon), relax in the rural setting at Greenwell Farms, experience rural life at Kona Coffee Living History Farm, then explore the wealth of natural beauty at Pu'uhonua O Honaunau National Historical Park, and finally contemplate the waterfront views at Honaunau Bay. Get ready for a full day of sightseeing on the 10th (Tue): relax in the rural setting at Big Island Bees, look for all kinds of wild species at Kealakekua Bay, then relax in the rural setting at Kona Joe Coffee, and finally tour the pleasant surroundings at Kahaluu Beach. To see traveler tips, where to stay, more things to do, and other tourist information, you can read our Kealakekua sightseeing planner. Traveling by car from Volcano to Kealakekua takes 2 hours. Expect a daytime high around 85°F in October, and nighttime lows around 74°F. Wrap up your sightseeing on the 10th (Tue) to allow time to drive to Kailua-Kona. You'll visit kid-friendly attractions like Akaka Falls State Park and Swim with Dolphins. Take a break from the city and head to Hapuna Beach State Recreation Area and Manini'owali Beach (Kua Bay). Take a break from Kailua-Kona with a short trip to Waipio Valley Lookout in Honokaa, about 1h 30 min away. 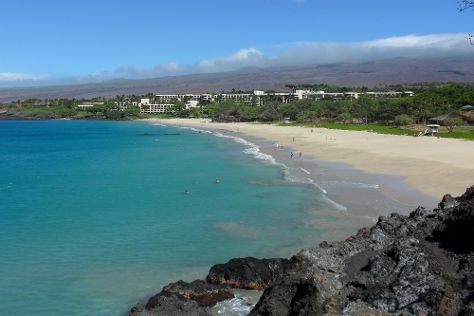 And it doesn't end there: see some colorful creatures with a scuba or snorkeling tour, take in the awesome beauty at Mauna Kea Summit, and tour the pleasant surroundings at Mauna Kea Beach. For maps, reviews, traveler tips, and other tourist information, read our Kailua-Kona trip generator. Kailua-Kona is just a stone's throw from Kealakekua. October in Kailua-Kona sees daily highs of 85°F and lows of 74°F at night. On the 15th (Sun), you're off tohome.